signed and on verso signed, titled, dated Oct. 1959 and inscribed "60331/4"
A.Y. Jackson once said, "I like to think of a sketch not as a little picture but rather as an idea for a big one," and this fresh and fluid oil on board work was the "idea" for the canvas The Madawaska at Arnprior, lot 125 in this sale. Arnprior reflects Jackson's practice of painting on the spot, deftly selecting what would make the strongest image from what he observed. Rhythm in the landscape was always important to Jackson, and in Arnprior, his rollicking brush-strokes follow the waves of water sweeping around small, treed rocky outcroppings. In his palette, the warm colours of fall dominate, and the town blends in with the screen of trees glowing with orange and gold, above which rise the distinctive towers of the church. The bare orange-toned panel shows through the layers of paint, making us aware of Jackson's painting process and adding further warmth of colour. 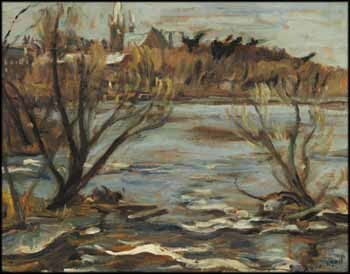 Arnprior is a rich and spontaneous oil sketch from the body of work Jackson produced in the Ottawa Valley after moving to Manotick in 1955.